This module developped by LIBRASOFT gives you the best protection for your shop against thiefs and hackers. 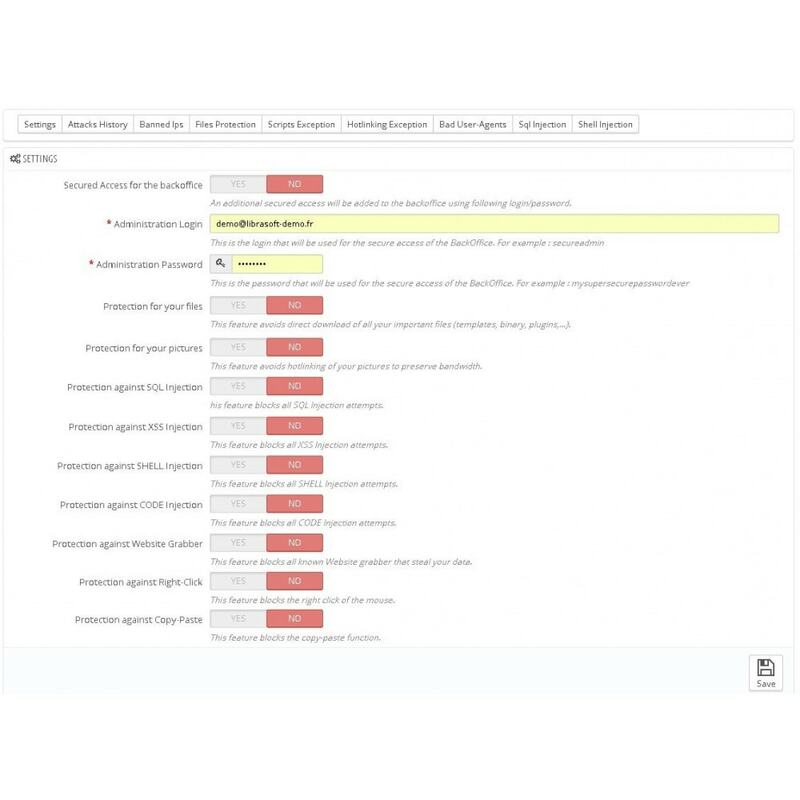 You can parameter in your back office 9 scripts of protection. In the back-office of the module, you can activate / unactivate one by one the protection scripts. The protection is totally personalizable, activating or not some protections, but even some specific rules of these protections. No surprise, you can adapt the protections to your needs easily through the multiples available tabs of personalisation. Your shop protection has no price. 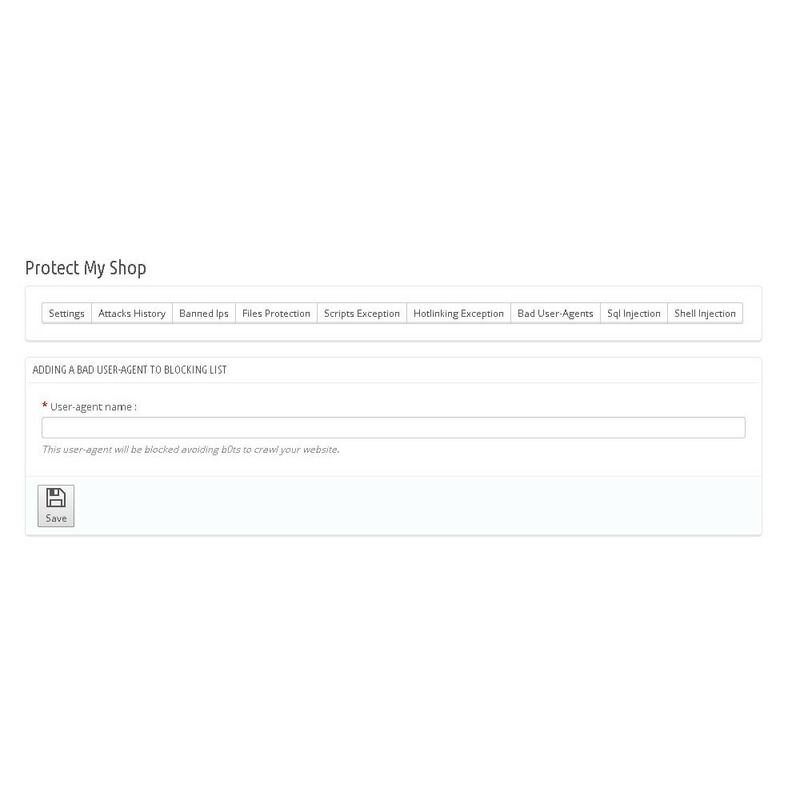 Protect My Shop Module is the better protection module ever developped for PrestaShop. This protection is implementing secure access via .htaccess on the back office using the login and password that you enter. This protection prevents the user from using the function copy - paste of the keyboard. (CTRL-C and CTRL-V), which could allow him to steal the content of your web site. 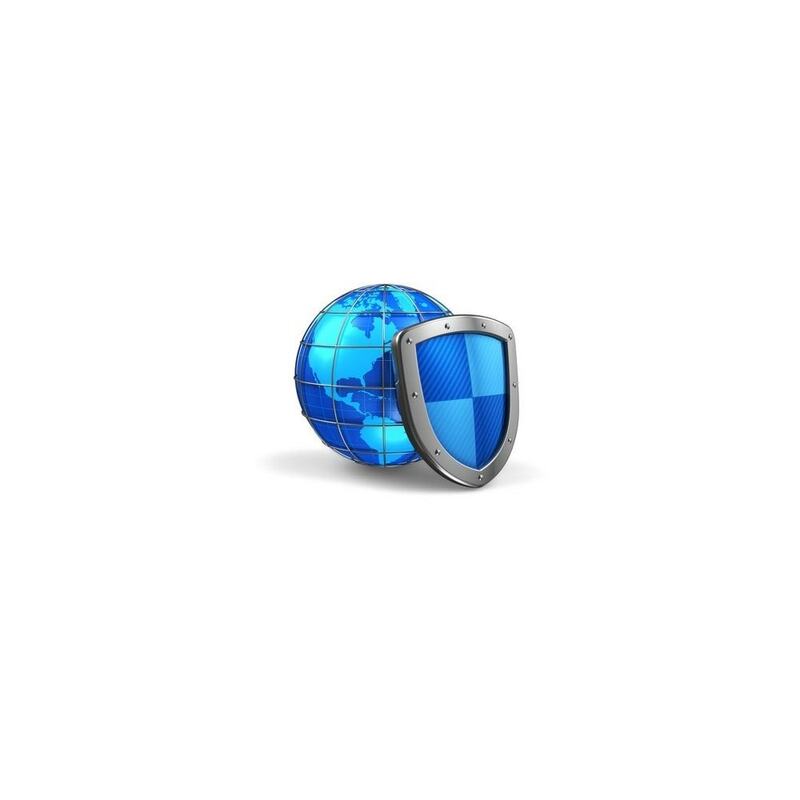 This protects your site against all known website grabber, to prevent copying and theft of your data. You have the ability to add, edit and disable User-Agents in the blacklist on the Bad-User-Agents tab. This protects your site against all attack attempts throughs code injection. You have the Exception Scripts tab, allowing you to implement exceptions for certain scripts, or particular cases which could be blocked. This protects your site against all attack attempts by injecting SHELL commands. If necessary, you can disable commands to block via the Injection SHELL tab. In addition you have the Exception Scripts tab, allowing you to implement exceptions for certain scripts, or particular cases which could be blocked. This protects your site against all attack attempts through XSS injection. You have the Exception Scripts tab, allowing you to implement exceptions for certain scripts, or particular case which could be blocked. This protects your site against all attack attempts through SQL injection. If necessary, you can disable commands to block via the SQL Injection tab. In addition you have the Exception Scripts tab, allowing you to implement exceptions for certain scripts, or particular cases which could be blocked. This protection prevents unscrupulous web sites that link to your server pictures theyr are displaying o their web site. It thus protects your bandwidth. Search engines are not blocked, and can access your images for SEO. You also have the option to add exceptions if you want to allow a particular web site via the hotlinking tab. This protection prevents the direct download of files considered sensitive. You can add, edit, or disable the type of file to protect in the protection of the files tab. Unzip the file and copy the folder /protectmyshop in /modules. 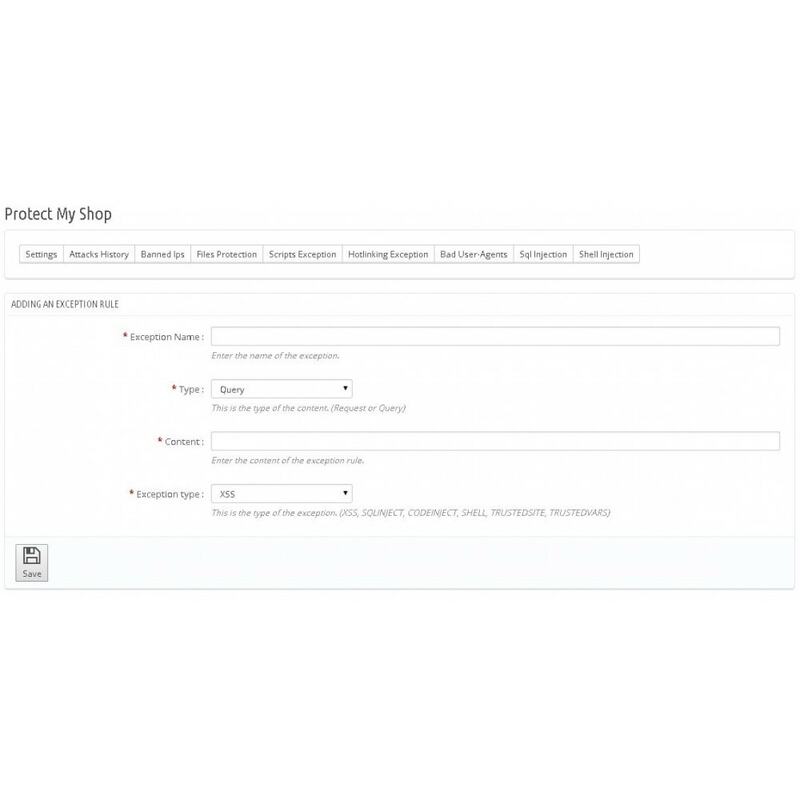 Look for the module Protectmyshop and click on install. This module developed by Librasoft allows you to make sure of the authenticity of an email address by sending a confirmation link by mail.